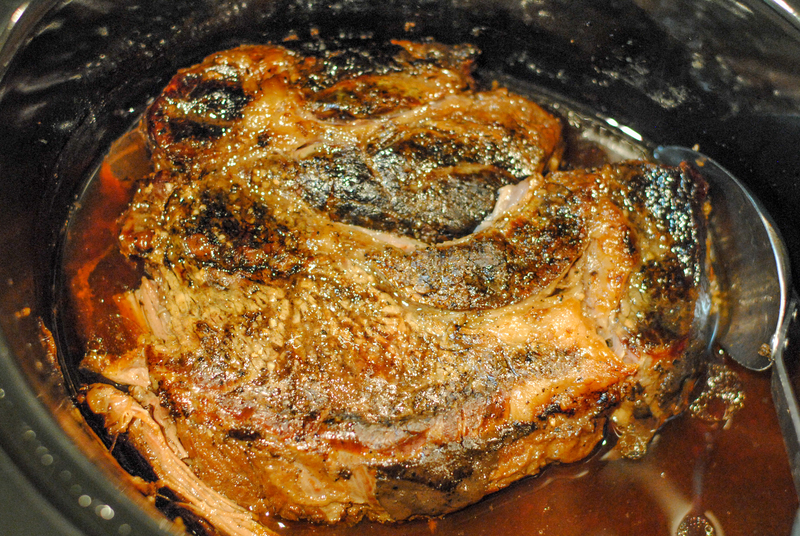 For years I’ve stuck by my tried and true pot roast recipe – it’s good. Real good. But a few months ago I went looking for something a little different where I could rely on my crock pot to do most the work. I came across this recipe on Pinterest, and it was instantly a crowd-pleaser. The meat is super tender, and the flavor is awesome. It’s very simple – mix up the sauce, pour it over the meat in the crock pot, turn it on and forget about it. If you like a gravy with your meat, you remove the drippings at the end and simmer it on the stove with some corn starch. Last night was probably my 6th time I’ve made this, and every time I go to my blog to find the recipe, only to be reminded that I haven’t blogged this recipe yet. Well darn it, I’m finally doing it – partly to share with others… and partly so that in a few weeks when I want to make this again and I don’t have to search through hundreds of my pins 🙂 Since one of my kiddos is on a gluten-free diet, I just subbed gluten free soy sauce for the regular variety, and my whole family can eat it. Hope you enjoy! 1.) In a medium bowl, whisk together beef broth, balsamic vinegar, Worcestershire sauce, soy sauce, honey, garlic and pepper. 2.) 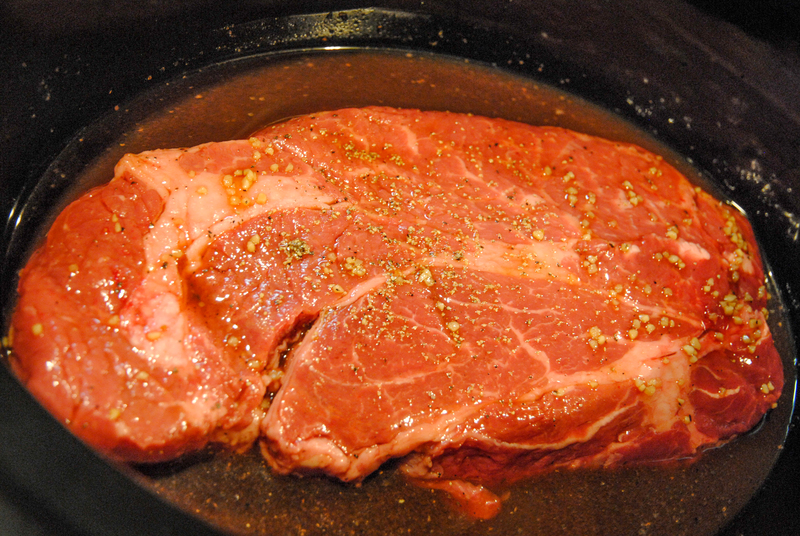 Place chuck roast in crock pot and pour sauce over top. 3.) Set crock pot to Low and cook for about 6 hours. Take 1 1/2 cups of the drippings from the roast and place in a small saucepan. Mix the 2 tbsp corn starch with a few tbsps of cold water in a small bowl and mix until smooth. 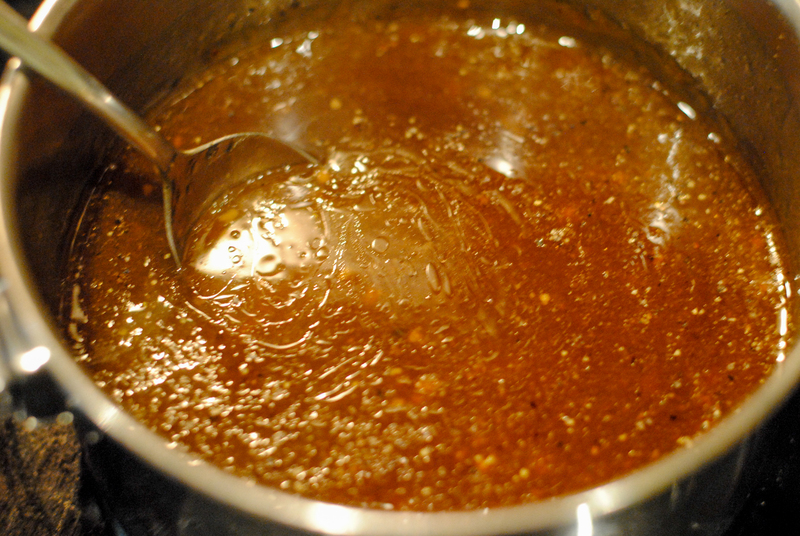 Whisk into drippings, and heat over medium high-heat until it simmers and sauce begins to thicken. Salt and pepper to taste. This entry was posted in Food and tagged Chuck roast, Crock pot, Dinner, Gluten free, Ground beef, Pot roast by biscuitsncrazy. Bookmark the permalink. I use a nearly identical recipe and the family loves it. If I’m in the mood, I’ll add a couple of tablespoons of spicy mustard to the braising liquid.